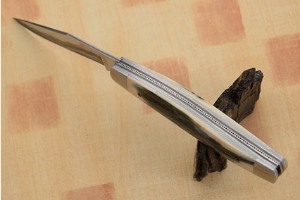 Blade thickness (near bolster): 0.80 in. 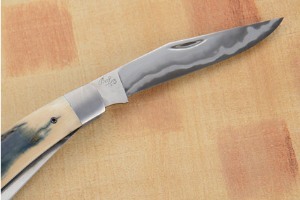 Description: Bill Burke, who was honored as a Mastersmith June 2006, makes knives that are as high performance as a knife can get. 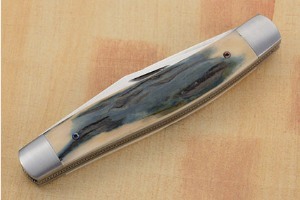 Slipjoint folders embody a sense of old fashioned ingenuity and this piece is certainly no exception. Here, Bill has put his hands to a very rare and very elegant folder. The blades are formed from a stainless steel san mai -- Bill began by forging 416 stainless steel surrounding a 52100 carbon steel core -- a steel that many knifemakers and knife collectors find to produce the best and longest lasting edges. By surrounding the carbon steel with layers of stainless steel, Bill has made this a knife that is extremely high performance, yet easier to maintain than a standard carbon steel knife. 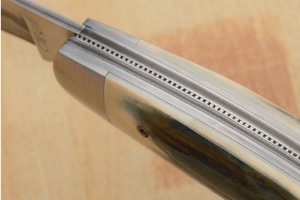 Plus, let's face it, the transition between stainless and carbon steels just looks cool! 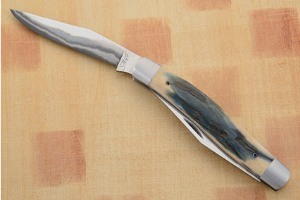 This traditional folder includes two clip point blades. Both blades can be opened by a single sided thumb nick. 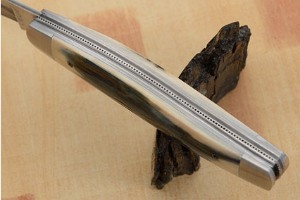 The scales are exhibition grade ancient mammoth ivory. Blue and green hues with dark veins travel across a creamy toned background. 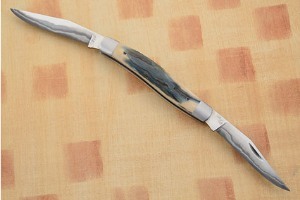 Mammoth ivory of this quality and color is particularly rare. The scales are perfectly fit to the 416 front and rear bolsters and are secured with heat blued Torx screws. The action is smooth and the blades perfectly centered. Each of the blades has a 1/2 stop. 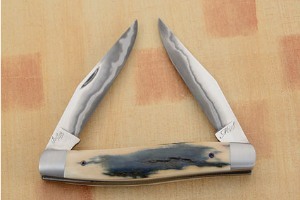 A rare and exquisite piece from Mastersmith Bill Burke!